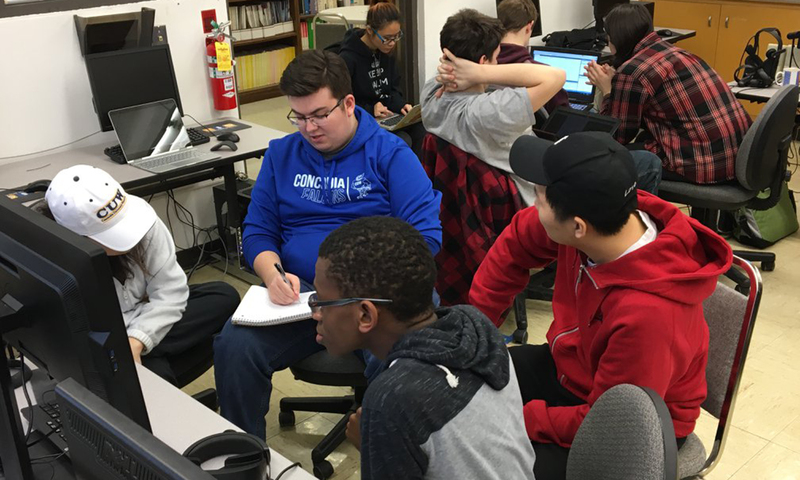 Nearly 50 Concordia University Wisconsin students participated in the computer science department's fourth annual hackathon event this past weekend. 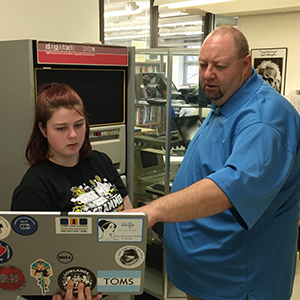 This immersive learning event required students to quickly design and create (or “hack”) a real product following a given set of requirements. Teams were given the choice of creating meaningful solutions using either VR (such as an HTC Vive or Oculus Rift) or mobile (Android) technology. On April 14, eight teams battled the clock to come up with unique solutions to real-world problems, creating four mobile apps and four VR apps in 12 hours. The mobile solutions included an improved CUW roommate selection questionnaire, a classroom reservation system, and a “Yelp”-like app for the cafeteria, while the VR apps ranged from a multi-user environment to a challenge course to a blockchain simulator. 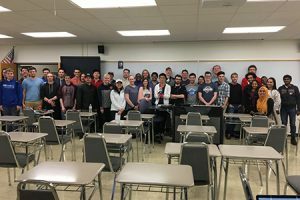 Alumnus Josh Curcio led his team to victory with a “hide-and-seek” game, in which one person in a VR environment chases two people who are using XBox controllers outside of VR. In a close second place, senior Corey Newhouse’s team created a mobile app that would allow charities to post requests (such as for donations and volunteer opportunities) that users of the app could view and sign up to fulfill. The department has been hosting hackathons since 2016 and is proud that its fourth event was a highly successful and enriching student experience. Special thanks to all the students and professors who helped to make this hackathon a success. Visit the computer science department’s Facebook page to view more photos from the event. Learn more about Concordia’s computer science bachelor’s program here and the computer science master’s program here. —This article is written by Josh Locklair, assistant professor of computer science.